You may nominate a colleague for an annual award at any time! Awards are presented at the annual conference, but we accept and encourage nominations throughout the year. (Nominations must be submitted by March 15, 2019 to be considered for the summer conference in 2019. Nominations received after that date will be considered for 2020.) Please review the categories below and consider nominating a colleague. The purpose of this award is to recognize teachers and students for their efforts in service learning. Service learning goes beyond community service to include background knowledge and research of an issue to which students can connect. Projects should examine not only the current status of the community issue, but should also include a study of the causes and the possible solutions. This award is the most prestigious award given by the NSCSS. It is intended to recognize people who have made a major impact over the years on the social studies teaching profession in the state of Nebraska. ​Dr. Beck was a very popular university professor who specialized in U.S. diplomatic history. He was a long time member of the Organization of American Historians and did presentations for the OAH as well as the annual Missouri Valley History Conferences held in Omaha. In 1979 Dr. Philip S. Holmgren (former chairman of the Kearney State College Department of History and Philosophy) stated “Paul was a good classroom man and pioneered a number of courses, including one in black history.” He made numerous presentations for area teacher conferences and meetings. He served as an advisor for several social teachers seeking a master’s degree in history at UNO. He was always willing to share his expertise in social studies with any teacher who needed help His most endearing attribute was that he was a genuine friend, mentor and advocate for social studies teachers in the private and public schools. The Nebraska State Council for Social Studies created the annual Paul Beck Award in 1975. Past winners have included both university professors and teachers in the public and private schools. Winners of the award have included: Harris Payne, Dr. Rick Kolowski, Dr. Orville Menard, Dr. Steve Bullock, Mary Lynn Reiser, Lonnie Moore, and our most recent winner--Doris Huffman. The 2018 NSCSS Awards Ceremony was held on Thursday, May 31. 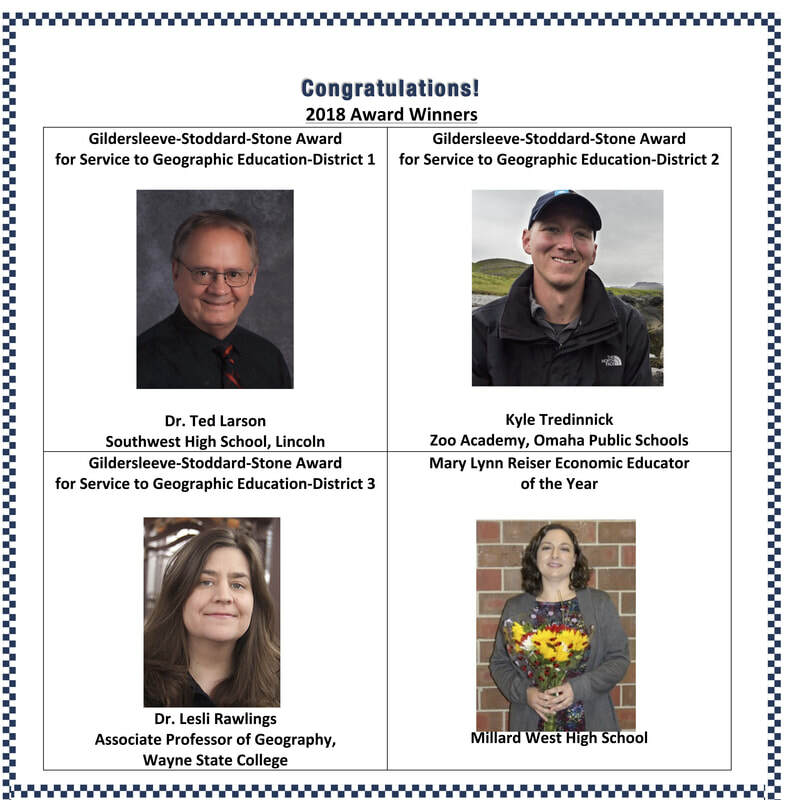 Outstanding Nebraska social studies educators were honored. These 10 educators were honored for their outstanding work in social studies education! Our annual Awards Ceremony was held at the Nebraska History Museum in Lincoln on Thursday, May 31.